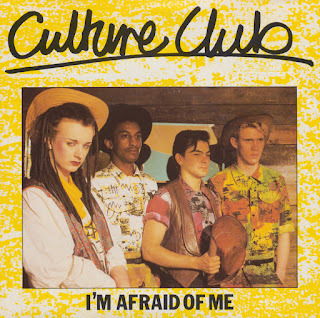 Prior to 'making it big' with Do you really want to hurt me, Culture Club released two singles that weren't quite so successful. I found the first one - White boy - eight years ago, and this month number two popped up almost equally cheap: 'I'm afraid of me'. The single only got to number 100 of the UK singles chart. A remixed version of this track appeared on the band's debut album 'Kissing to be clever'. 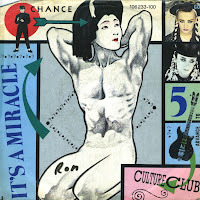 'It's a Miracle' was released as the fifth and final single from Culture Club's 1983 album 'Colour by numbers'. The song was first called 'It's America', relating to Culture Club's first trip to the United States. It was later changed. It became the group's sixth top 5 hit on the UK Singles Chart, peaking at number 4. In the Dutch Top 40, the single reached number 20. Culture Club released their third album 'Waking up with the house on fire' in 1984. In an attempt to profit from their fame, the record company pushed them to come up with new material as soon as their world tour had ended. The band was a bit tired, and it can be heard in the songs on the album. The lead single 'The war song' was not very inspired, but ended up being the one hit single from the album. It reached number 2 in the UK singles chart and number 5 in the Dutch Top 40. Subsequent singles were far less successful. 'Church of the poisoned mind' was Culture Club's third big hit single, released in spring 1983. The uptempo track has some similarities to Motown tracks, especially 'Uptight (Everything's alright)' by Stevie Wonder. The single was a number 2 hit in the UK singles chart and reached number 7 in the Dutch Top 40. The band also had their first hit in the USA with this track, peaking at number 10 in the Billboard Hot 100 chart. 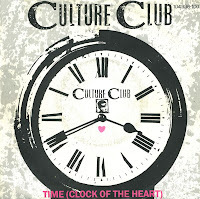 'Time (Clock of the heart)' was a stand-alone single in most of the world, but the track was included on the American version of Culture Club's debut album 'Kissing to be clever'. 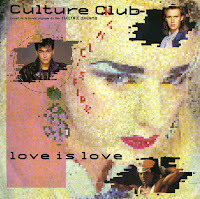 In Europe, its first inclusion on a Culture Club album was on their 1987 compilation, called 'This time: the first four years'. The single reached number 3 in the UK singles chart, number 2 in the US Billboard Hot 100 chart and number 7 in the Dutch Top 40. 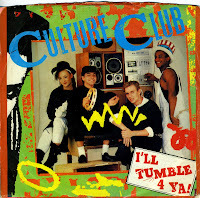 'I'll tumble 4 ya' appeared on Culture Club's debut album 'Kissing to be clever'. It was released as a single in North America only, peaking at number 9 in both the USA and Canada. 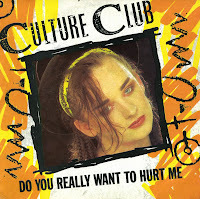 The B-side, 'Mystery boy', was originally Culture Club's third single, released before they had their international breakthrough with 'Do you really want to hurt me'. After scouring the basement of the Music & Video Exchange in Notting Hill Gate and finding over 40 singles, I went up to the first floor, hoping to find some more. This is the 'expensive' part of the shop, stocking mainly collectors items, but sometimes you come across some interesting bargains. 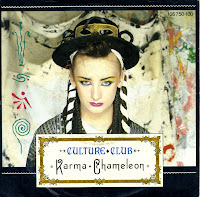 Such as this one: the debut single by Culture Club! Most people assume that their first hit 'Do you really want to hurt me' was also their debut single, but that's not true: they released two singles prior to that one. 'White boy' did not chart in any territory, although it already showcases their signature sound. You don't see this single a lot, so I was glad to find it. 'The medal song' was released in 1984 as the second single from the album 'Waking up with the house on fire', Culture Club's third album. Boy George later commented he felt the album experienced a lukewarm reception because of the half-hearted material on the album. The group was pressured by their record company to come up with a quick follow-up to their second album 'Colour by numbers'. 'The medal song' performed poorly in the charts, peaking at number 32 in the UK singles chart and their first hit single not to reach the top 10 in the UK. Not even this limited edition gatefold sleeve could help matters much. Part of my renewed interest in buying 7" vinyl singles is caused by my realisation that there are some very odd holes in my collection. 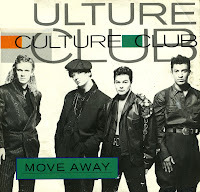 This one is a prime example of that: while I have most of Culture Club's hit singles, their first major hit single was missing. 'Do you really want to hurt me' became a major hit after their memorable debut performance on 'Top of the Pops', which they got thanks to Shakin' Stevens being ill and not able to appear, leading the song to become a UK number 1 single for three weeks in October 1982. The single also became a number one hit in Switzerland, Sweden, Ireland, Germany, Canada, Austria and Australia. In the Netherlands, the song peaked at number 2. In 1984, Culture Club was asked to write two songs for the soundtrack to the movie 'Electric Dreams'. Boy George and Roy Hay wrote 'The dream' and 'Love is love'. The latter was released as a single in Canada, Japan and France. It was only a hit in Japan. I found this single and didn't even know it existed. It was interesting enough for me to want to have it, especially since that other song from 'Electric dreams' ('Together in electric dreams' by Phil Oakey and Giorgio Moroder) has become an Eighties classic. It was interesting to find out how this song would compare. 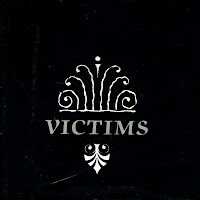 After many uptempo and midtempo singles, 'Victims' was Culture Club's first proper ballad, released as a single in late 1983. The single reached number 3 in the UK singles chart, and only number 16 in the Dutch Top 40. 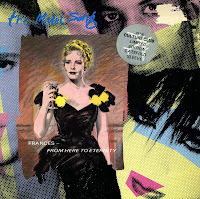 I first bought the single during the 1985 edition of Parkpop, which was the regular German pressing. 15 years later I found myself confronted with a posterbag edition, sightly worn but still in good condition. It was a steal! So I bought this one too. 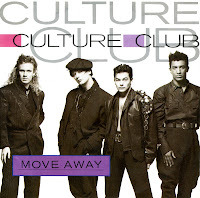 'Move away' was the first single drawn from Culture Club's 1986 album 'From luxury to heartache'. The recording sessions for this album dragged on for a long time because of singer Boy George's addiction to cocaine. 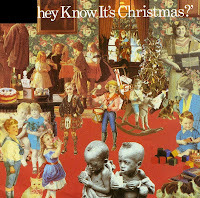 Nevertheless, this single became a hit for the band, because it reached number 7 in the UK and number 12 in the USA. Besides the regular 7" single, the record company released a collectable cd-sized picture disc in a cardboard cd-single-esque sleeve. The picture disc featured a photograph of band member Jon Moss. Both singles are pictured here: you will notice that the regular sleeve has purple blocks, where the cd-sized sleeve has green blocks. 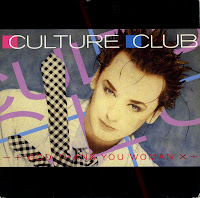 'God thank you woman' was the last single from the Culture Club before they broke up in 1986. Lacking the immediate appeal of their early singles, it has actually stood the test of time better than those big hits. At least, that's what I think now that I've heard this track for the first time in a long time. It is a positive, uplifting song with a few strange and surprising turns. The B-side of this single is the track 'From luxury to heartache', which was the title of their 1986 album. This track, however, was only available here, on this single.